Boroughmuir coach Peter Wright has heaped praise on his men for the character they showed in securing a 27-0 win away at Glasgow Hawks that means the Meggetland club will remain in the BT Premiership next season. Contested in difficult conditions in front of a small crowd affected by the competing attraction of televised Six Nations rugby, the match was a must-win encounter for Muir whose inconsistent form throughout the campaign had left them scrapping for survival. And the players turned on the style when it mattered to take a bonus-point victory and emerge with Wright’s plaudits ringing in their ears. With both sides fighting for survival in the top flight, it was no surprise that the first half proved to be a cagey affair. Muir just held the initiative at the interval, with a penalty from Chris Laidlaw giving them a 3-0 lead. The visitors raised the pace after the restart and bagged tries through Jordan Edmunds, Grant McConnell, Sean Kennedy and Mike Brown, with Laidlaw booting two of the conversions. The tightness of the league was reflected in the fact that the result left Muir occupying sixth spot in the table. The win, combined with results elsewhere, means that Marr are relegated automatically and Hawks will face the runners-up from BT National Division one in the promotion/relegation play-off. 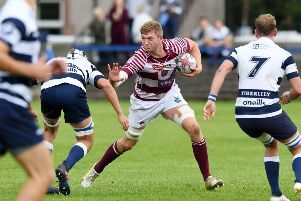 The two sides in that league vying for the leading spots met on Saturday, when Jed-Forest welcomed Edinburgh Accies to Riverside Park. Accies, who held a five-point lead over Jed at the top of the table, started well and opened the scoring with a penalty from Richard Mill. However, the Borderers struck back with three tries to lead 17-3 at half-time. Mill added a second penalty early in the second half, but a bonus-point touchdown for the hosts left the Capital men with too much to do to avoid a first defeat of the campaign. That outcome means that with four matches to play, the sides share top spot – although Accies have a superior points difference – and are guaranteed to fill the top two places.